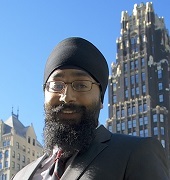 Hansdeep Singh is Co-Founder and Director of Legal Programs for the International Center for Advocates Against Discrimination (ICAAD), a litigation and advocacy center focused on the eradication of structural discrimination globally and the promotion of human rights norms consistent with public international law. His experiences include work at Human Rights Watch (HRW) women’s rights and legal division focusing on domestic violence and religious freedom. At the International Criminal Tribunals of Rwanda and Yugoslavia, he worked with a team of experienced international lawyers in chambers and also with the Office of Prosecution (OTP) to address mass atrocities (i.e. crimes against humanity, war crimes, and genocide). In 2011, he authored a Report arguing that the treatment of specific minorities by the Transportation Security Agency (TSA) amounted to degrading treatment in violation of Art. 16 of the Convention Against Torture (CAT). He also he co-authored the Global Sikh Civil & Human Rights Report in 2010. Hansdeep graduated Fordham School of Law with a L.L.M. in International Law & Justice and graduated from California Western School of Law (CWSL) with a J.D., and is a member of the New York (and soon to be California) bar. He has his BA in Biology and History from the University of Southern California (USC) in Los Angeles, where he grew up.